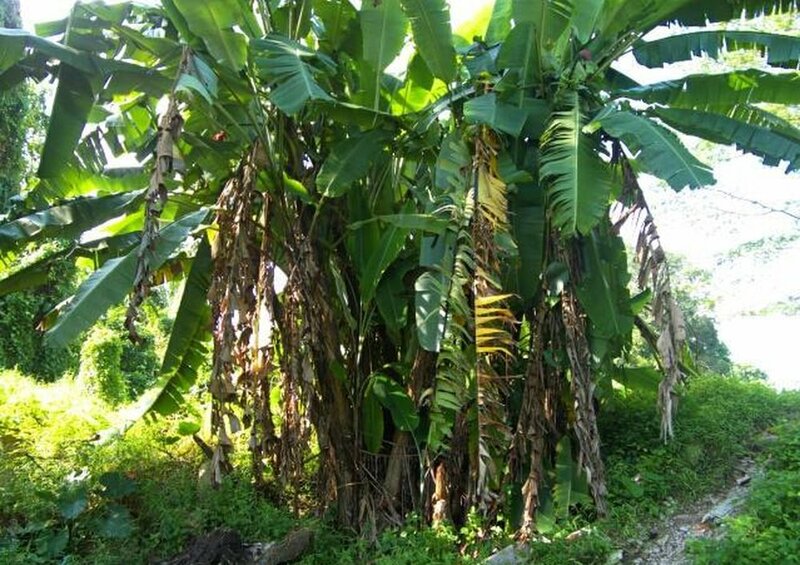 Centered is the Banana tree. Musa species are native to tropical Indomalaya and Australia, and are likely to have been first domesticated in Papua New Guinea. 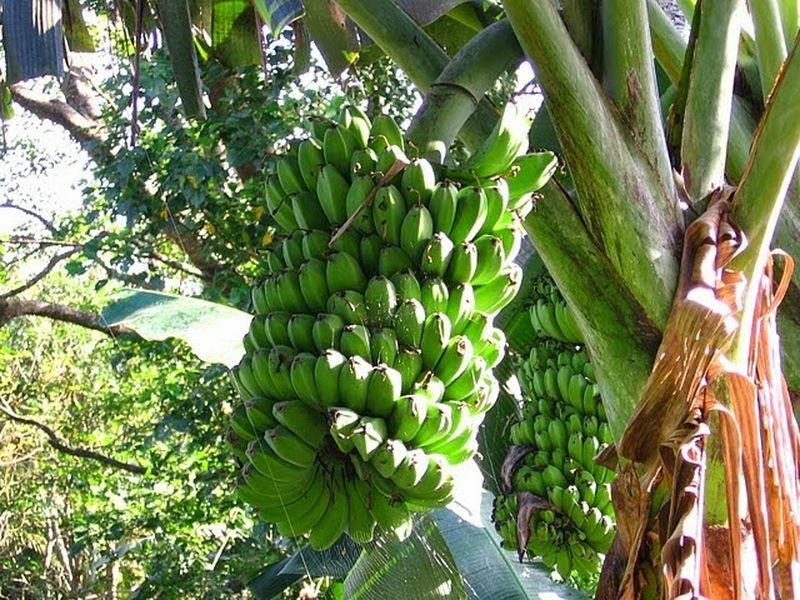 They are grown in 135 countries, primarily for their fruit, and to a lesser extent to make fiber, banana wine, and banana beer and as ornamental plants. Also, centered, is Guava tree. Psidium is a genus of trees and shrubs in the family Myrtaceae. It is native to warmer parts of the Western Hemisphere (Mexico, Central and South America, the West Indies, Galápagos, and the southern United States). Guava is a common tropical fruit cultivated and enjoyed in many tropical and subtropical regions. Psidium guajava (common guava, lemon guava) is a small tree in the myrtle family (Myrtaceae), native to Mexico, Central America, and northern South America. 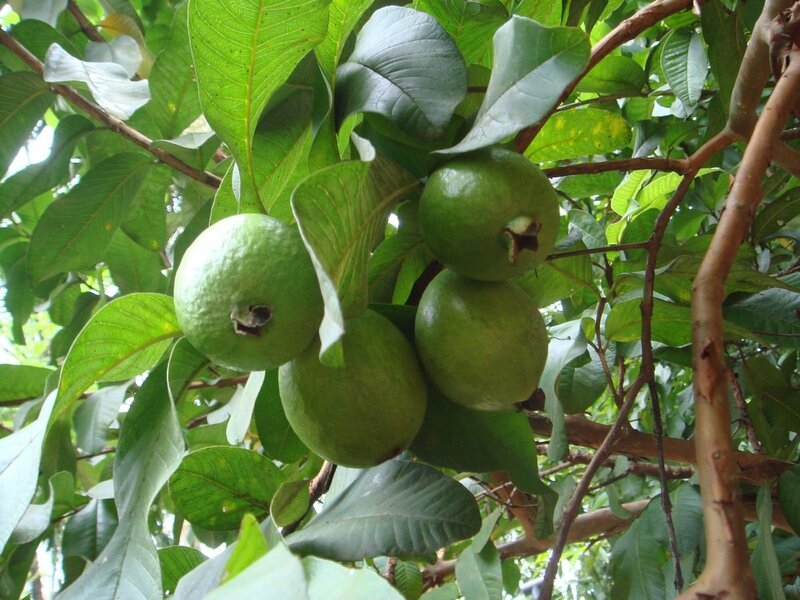 Although related species may also be called guavas, they belong to other species or genera, such as the "pineapple guava" Acca sellowiana. In 2011, India was the largest producer of guavas. The coconut trees and pineapples are on left and right sides. The coconut tree (Cocos nucifera) is a member of the palm tree family (Arecaceae) and the only living species of the genus Cocos. The term "coconut" (or the archaic "cocoanut") can refer to the whole coconut palm, the seed, or the fruit, which botanically is a drupe, not a nut. The term is derived from the XVI-century Portuguese and Spanish word coco meaning "head" or "skull" after the three indentations on the coconut shell that resemble facial features. Coconuts are known for their versatility of uses, ranging from food to cosmetics. The inner flesh of the mature seed forms a regular part of the diets of many people in the tropics and subtropics. Coconuts are distinct from other fruits because their endosperm contains a large quantity of clear liquid, called "coconut milk" in the literature, and when immature, may be harvested for their potable "coconut water", also called "coconut juice". 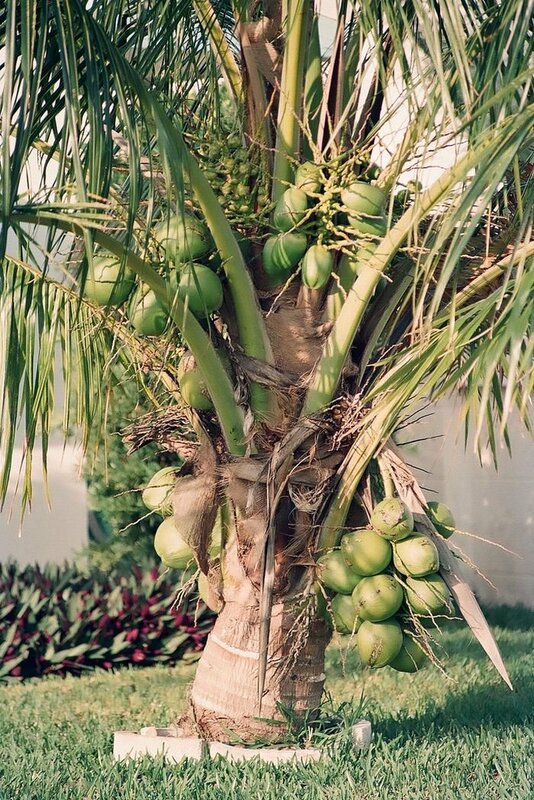 Mature, ripe coconuts can be used as edible seeds, or processed for oil and plant milk from the flesh, charcoal from the hard shell, and coir from the fibrous husk. Dried coconut flesh is called copra, and the oil and milk derived from it are commonly used in cooking – frying in particular – as well as in soaps and cosmetics. 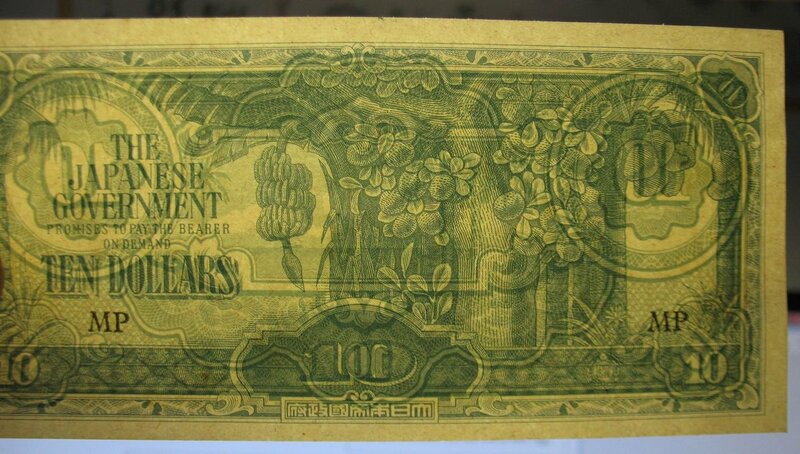 The hard shells, fibrous husks and long pinnate leaves can be used as material to make a variety of products for furnishing and decorating. The coconut also has cultural and religious significance in certain societies, particularly in India, where it is used in Hindu rituals. Beach facing the sea. The steam ship is on the horizon.